Home > Quizzes & Puzzles > Sudoku Follow Up. Togo? 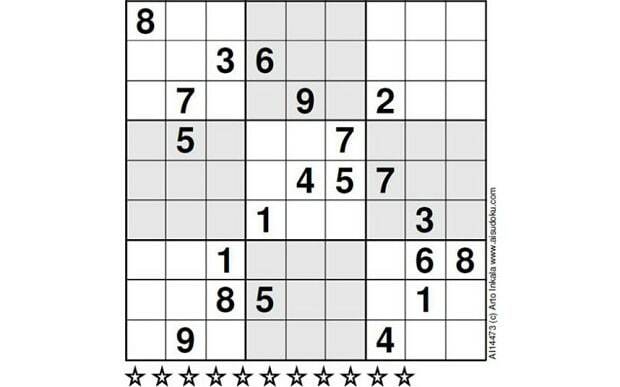 I posted during the week regarding a 'very hard' sudoku puzzle book I had picked up recently. It was interesting to hear different opinions on people's techniques. One person in particular was a sudoku genius, Togo. I would really like any comments on this puzzle that I'm working on at the moment. I've filled out all numbers that I'm sure of and to the best of my ability I've pencilled in all possibilities in the other boxes. This is as far as I can go without now filling in one of the boxes with only 2 possibilities (eg 6 or 9 on the middle right) and working the rest out from there. If this doesn't work I will then try the other number and it should then solve. What am I missing so that I don't have to resort to this technique to complete the puzzle? Looking forward to being taught a thing or two. No best answer has yet been selected by flobadob. Once a best answer has been selected, it will be shown here. He's probably watching Stoke play football. I've changed techniques as time has gone on. I used to start considering lines of 3, 9x9 boxes at a time first; nowadays I'm more likely to go through the the numbers one at a yime, from 1 up to 9, and look at the table as a whole. Once the obvious stuff is done though, it gets more complex, one tends to pick up tricks, but too many to go through, many difficult to describe. But I suspect yout well aware of most of what I've written so far. One place I have picked up techniques though is here http://www.sudokuwiki.org/sudoku.htm there's links to various options down the right, but with my memory I can never recall many of them. Maybe print them out and inwardly digest ? Sadly true Tills. Just having a bite to eat. Have printed it Flobadob, Give me a minute to wind down from my rage. In your present game, use highlighter (circle assumed right, square in consequentislly wrong) and see what comes out. Perhaps randomly choose one of the potential 9s as good, tag others in row, column, block as bad, then move around the table marking others goid or gad as the marked ones affect them. If you get a contradiction, such as two good ones in a row, it tells you your guess was wrong, restart with a different one. One the other hand it goes ok, you are on your way. May need to do this more than once if the chain ends and there are still undecided cells. I was actually able to complete this one by assuming the square in the middle right was the 6 rather than the 9 and was then able to use all my other workings to get the other numbers. What I'm hoping is that someone can point out something that I've missed, or a new technique that would let something be deduced from the puzzle as is, in the image. That was a bit tough Flobalob…….or I'm a bit "under par". Post the answer when I have loaded it. I took the liberty of making a new grid as well, so as not to be distracted. If you work through the 9&4 in the middle left grid you will find that if the 9 is put at the top of the grid you cannot resolve the 4th column in that comprises a 5, 4, &9 when you have filled in all of the bottom middle except the two outside bottom squares that are 9 & 5. That 4th column in, left hand column of the middle grids is spoiled by the 9 going top right middle eft hand grid. Yo do not get to that point until you have almost filled in the puzzle and only have 7 numbers unresolved. You need to carry 5 moves in your head. Drove me mad nearly. Lol Togo, I think I'm resolved to sticking as I am and going down the 50/50 route, cos I couldn't do that mental working out and remembering all possible combos. And there was me thinking there was going to be some magical formula. They each need reading through a few times, and seeing how they go on the diagram. My trouble is remembering more that the 'easy' set. One wishes to solve without referring back mid puzzle. I can’t remember how I did it exactly, but I had two possibilities for one square somewhere near the middle. I tried one, which led to a contradiction, so went with the other one. There’s an almost impossible one somewhere. I’ll try to find it to see how you all do. Started by filling the middle box with 2,3,8,6,9 (because 2,3,6,8,9 wouldn't go!) and then did as much "simple" filling as possible. After that the top of column 5 had to be 1/5. Tried 1 and that didn't work out, but 5 did - bingo! Ah, I didn't spot a "naked triple" involving 1,4,6 in the top left box, which would have avoided the need to resolve the 1/5 by trial and error. 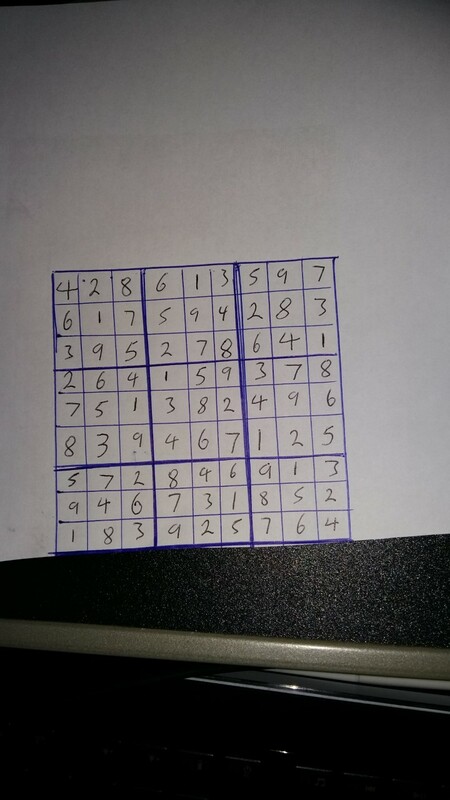 I was lucky that the first valid permutation of 2,3,6,8,9 that I tried for the middle box was correct. There were 29 other superficially valid permutations to work through! 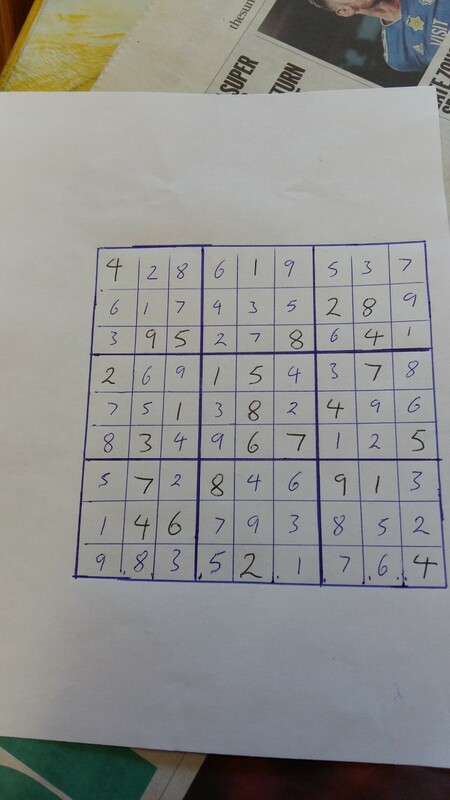 It was also lucky that I tackled the middle box: there are only 14 permutations of 2,3,5,7,9 that could fit in the bottom right-hand box but, surprisingly, even when the correct answer is inserted it doesn't allow much else to be filled in using "simple" logic. Hey Togo, I'm still flabbergasted at the skill of being able to complete the puzzle without having to fill in possibilities. I managed to complete it but only by using my 50/50 method. I might have another look at Old_Geezer's link and see if I can make head nor tail of it but I think not. As for Cloverjo's puzzle..... NOPE!!! !